So I have just four days to go, and four sleeps to go, until I embark on the greatest adventure of my life. I thought that Kilimanjaro was (and it was) massive, but this is simply bigger by miles. Kilimanjaro was a 7 day trek, and it took me to 19,340 feet. It was the best adventure I have ever had, and may stay that way, as I have no idea how this one will yet turn out. This trip is 22 days, takes me into the heart of the world’s highest mountain range, involves ice climbing with technical equipment, and takes me up to 20,305 feet. And to boot I get to stand in front of Mount Everest, the mother of them all. If I told you that I was just a little bit excited at the moment, then that would be the ‘mother’ of all understatements. I have been like a cat on a hot tin roof all day today. I cannot keep still, my heart is racing, I have probably burned about 5,000 calories in nervous energy – who needs the gym! I started to lay out my kit too, and buying the last few items that I will need. More on those later, but for now I thought I’d put down here the kit that I am taking. If anyone out there wishes to comment on the appropriateness or otherwise of what I have here, then I’d be very grateful. I still have no idea how I am actually going to get it all in and under the weight limit, but for now I am still assembling, so I will get to think about what I take away later. And that’s about it. 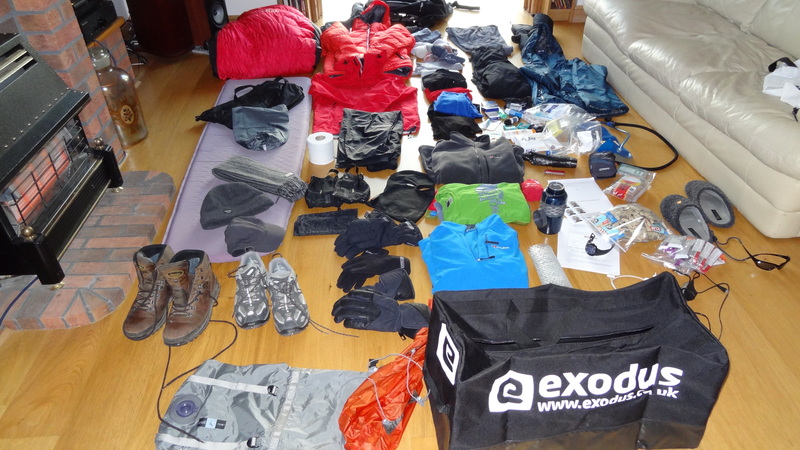 Sounds like a lot, but this is only the stuff for Everest Base Camp. I also have to have harness, ice axe, helmet, figure of eight, Slings, jumar, plastic boots, hand warmers etc etc. for Island Peak. The above also includes no ‘normal’ clothes – no underwear, T shirts, jumpers, or anything else for that matter. There won’t be room of course, as the above list I have to get down to just 12kg! That is going to be a nightmare, but it will be apparently weighed at the hotel in Kathmandhu, and I have to do it somehow. So as I said earlier – any and all comments welcome. The bag (that would be the small Exodus one in the foreground) will be packed and unpacked a few times in the next few days, and the air will be very blue indeed inside my house……I shall let you know how it is all going tomorrow.